Fans are advised NOT to park near the ground due to parking restrictions in the area, especially on matchdays. At the end of the M1, turn right (west) onto the A406 (North Circular) and follow it towards Harrow for nearly 4.5 miles. Turn left (east) onto the A40 heading into London (passing close to Loftus Road and after a little over 4 miles turn right (west) onto the A402 for just about 350 yards. Here you turn left (south) along the A219 for a little over half a mile. This brings you into Hammersmith where you turn right onto the A315 and then after just 130 yards or so turn left (south) back onto the A219. Follow this road for a little over a mile, and the ground down the side streets off to your right. Leave the M25 at Junction 15 and take the M4, which then becomes the A4, towards Central London. After around two miles branch off left into Hammersmith Broadway (before the flyover). Go around the ring road around central Hammersmith, keeping to the right. Then take the A219 Fulham Palace Road. Keep straight on this road, passing Charing Cross Hospital on your left. After about another half a mile, take one of the right hand turns for the ground. If you pass the Fulham Palace Garden Centre on your right, then you have gone too far. Leave the M25 at Junction 10 and take the A3 towards Central London. After around eight miles, leave the A3 at the turn off for the A219. Take the A219 towards Putney. Continue straight on this road, down Putney High Street and across Putney Bridge. You will see the ground on your left. Approx 112 miles and 2 hours travel time. The nearest London Underground station is Putney Bridge, which is on the District Line. The ground is about a fifteen minute walk. Turn left out of the station and then immediately turn right into a street called Ranelagh Gardens. As the road bends around to the right you will see the Eight Bells pub on your right. Turn left after the pub to take you up to the main road by Putney Bridge. Cross over to the other side of the main road and proceed up to the bridge and then on reaching the bridge turn right to enter into Bishops Park alongside the Thames. Just proceed through the park (keeping the Thames on your left) and you will reach the ground ahead. An alternative route by tube, is to get the Piccadilly Line to Hammersmith from Central London or Heathrow. It is then around a 20 minute walk to the ground, going straight down Fulham Palace Road (passing Charing Cross Hospital). 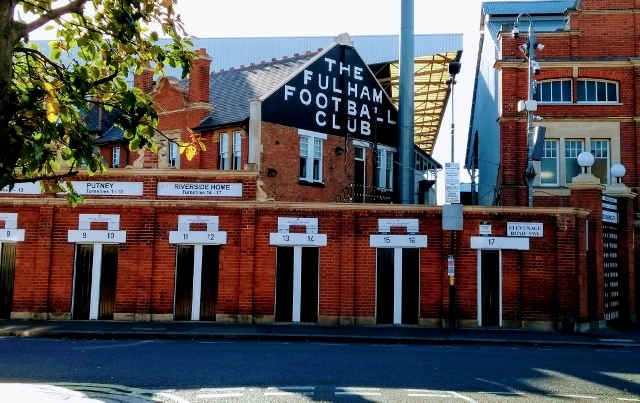 Further on you can then turn right into Crabtree Lane (for the pub of the same name) or carry on and turn right into Harbord Street for Craven Cottage. Near to the tube station is the 'Eight Bells' which is popular with away fans. “The Temperance" is only a few minutes walk away. From the Eight Bells walk up to the main road and turn right. The Temperance is across the road (Fulham High Street) on the corner. Opposite the Temperance on the same road is the King's Arms, which is also popular with visiting supporters. Further along the High Street is the King's Head which also admits visiting fans. There are many pubs close to the ground and the Courtfield Tavern, near Earls Court tube station is recommended.